Expanding south from Cancun to Tulum (a distance of some 128 kms/79.5 miles), the Riviera Maya is an ecological and socioeconomic flashpoint when it comes to coastal land use, property development and climate change. Developed for mass tourism over the course of recent decades, Mexico and the Caribbean coastal state of Quintana Roo have tread a fine line, attempting to maximize tourist visits and revenues while at the same time conserving local, indigenous culture and fragile coastal ecosystems – saltwater lagoons, mangrove forests and coral reefs. Two recent news items serve as examples of developments at opposite ends of the land use and change spectrum, illustrating the trade-offs, as well as the potential for conflict, that results from property and business development policies and decisions and the role, responsibilities and obligations private sector investors, government and local communities play in them. 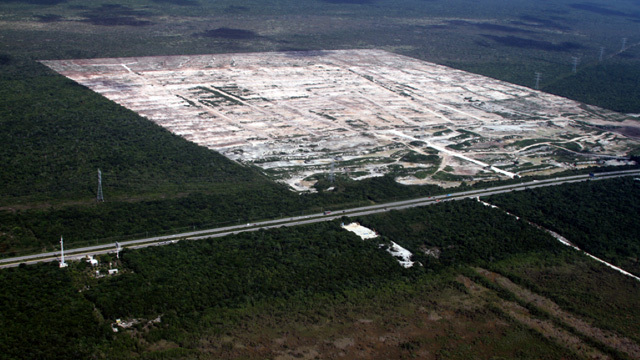 On Feb. 6 Mexico’s Federal Environment Protection Agency (Profepa) reported that nearly two years after it had halted construction, forests had begun to reclaim land at the ill-fated Dragon Mart mega-mall and wholesale trade complex. The Dragon Mall complex was being built on a roughly 357-hectare (882-acre) site of fragile mangrove and marine lagoon on the massive limestone shelf that is the Yucatan Peninsula. Financed by a consortium of Mexican property developers and a Chinese businessman acting via an offshore company registered in the Netherlands, the $200 million project was to serve as a showcase and flagship destination for shoppers and wholesale buyers of imported Chinese products – electronics, software, toys, clothing and building supplies, as well as others, a local news report explains. 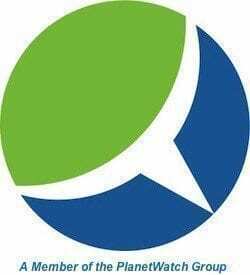 The development plan also included building what amounts to a small town in the center of the shopping mall and trade complex to house some 700 Chinese workers. Profepa called a halt to construction in January 2015, explaining that the land was classified as forestry-oriented according to local government officials and that inspections had revealed numerous and various violations of environmental regulations, including the unauthorized clearing of all mangrove and sub-tropical forest vegetation. 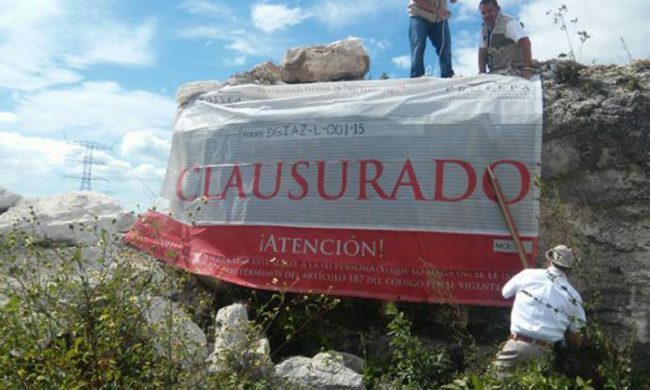 Subsequently, government officials shut down the Dragon Mart project permanently, imposed nearly 20 million Mexican pesos (some $1.2 million) in fines and filed a criminal complaint against the development company for destruction of natural vegetation. The Mexican Environmental Law Center then set a precedent requiring property developers to obtain permits and comply with all aspects of environmental impact statements, conservation measures that developers have typically been able to avoid, Riviera Maya News’ Santiago Tello explains. Also on February 6, Riviera Maya News reported that Quintana Roo’s honey harvest had begun. Tulum Beekeeper Association president Alfredo May Chulim told the press that local beekeepers were reporting an unprecedented abundance of flowering, which bodes well for this year’s honey harvest. Home to a stingless variety of bee – Melipona beecheii – the “roots” of beekeeping (aka apiculture) in Maya lands stretches back to antiquity. 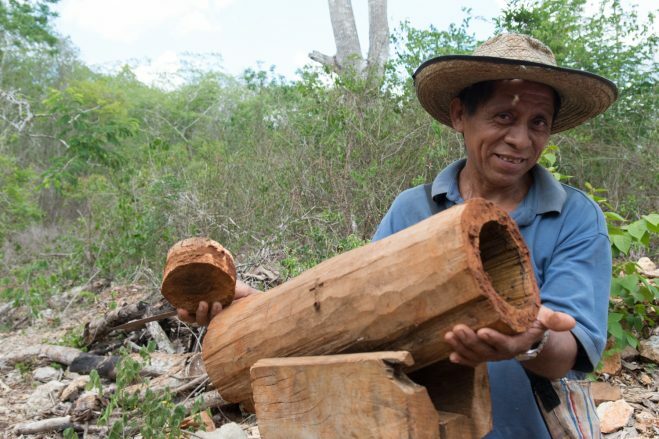 Today, beekeeping in southern Quintana Roo tops agriculture and livestock in terms of income and employment, reporter Roxana Niranda points out. The neighboring state of Yucatan is tops in Mexico when it comes to bee honey production. Best estimates peg the number of Yucatan families for whom apiculture and honey harvesting is the main source of income at 11,000. Much of the bee honey produced in Mexico winds up in markets and retail shops overseas. Mexico exported 42,000 tons of honey in 2015 to set a national record. Twelve thousand of the 42,000 tons originated in Yucatan, 8,000 in neighboring Campeche and 5,000 in the southern state of Chiapas, according to national statistics. The popularity, success and the sustainable, equitable stream of benefits being produced by local beekeepers and honey producers in Quintana Roo, throughout the Yucatan Peninsula and across Mexico stands in stark contrast to that of mega property development projects such as Dragon Mart. Similarly, the success of the local stingless honeybee contrasts sharply with the precipitous decline in populations of European honeybees in the U.S. and elsewhere, which have been key agents of pollination and agricultural production since their introduction during the course of European colonization.